Our next new Referees courses will run on Sunday 13th January 2019 in Charleville Park Hotel, Charleville, Co. Cork. Course starts with tea/coffee and scones on arrival at 9:30 am for registration. Followed by Lunch at 1:00pm. If you or anybody you know is interested in taking up refereeing then please contact Chris Harrington as outlined on poster below or complete email form at the bottom of the page and we will pass on your details to him. 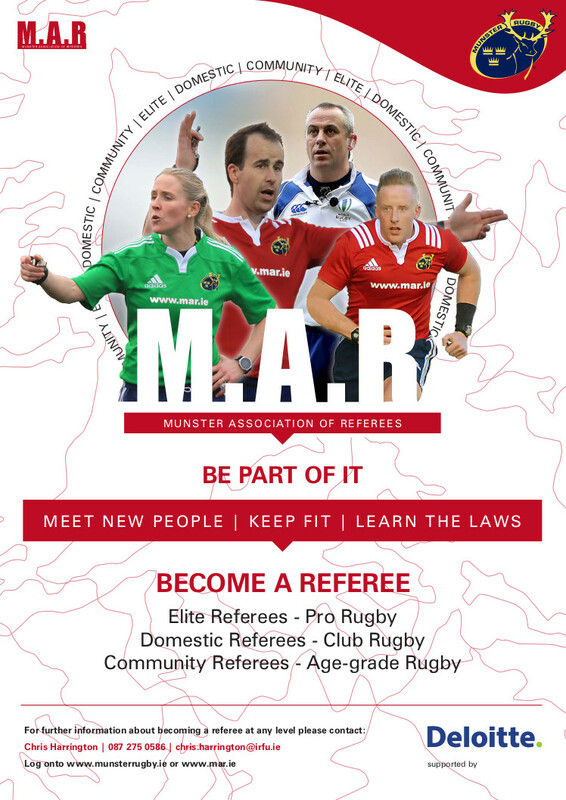 The Munster Association of Referees (I.R.F.U) is giving you the opportunity to give back to the sport. Rugby referees enjoy the same benefits of the game as the players - without the injuries! If keeping fit (referees run six miles in an 80 minute match), travelling, taking part in a lively social scene or getting an adrenaline rush is your idea of a great pastime, rugby refereeing could be for you. As well as the obvious benefits, a referee's constant study of the game enriches their enjoyment of this lifetime sport. There is more need for referees now than ever! The Munster Association Of Referees (M.A.R.) are currently recruiting for new referees to take up the role throughout the province. The call is open to both male and females who would like to take the general refereeing path or those who wish to support clubs at a local level through community refereeing. 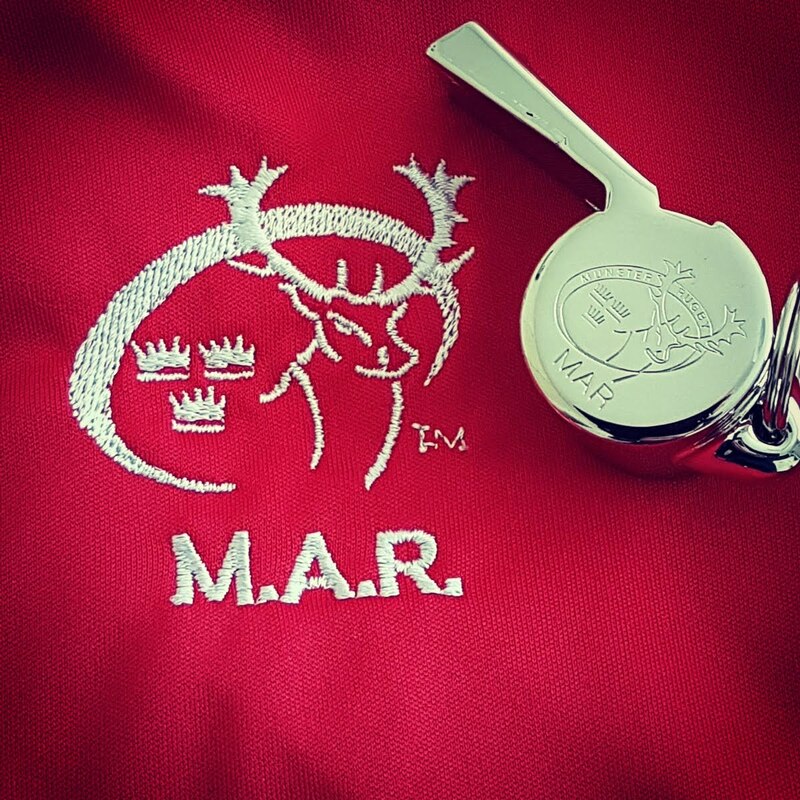 The Munster Association of Referees (I.R.F.U) would like to invite those interested in taking up a rewarding career officiating and supporting Munster Rugby to contact Chris Harrington I.R.F.U. Referee Development Manager (Munster) by email chris.harrington@irfu.ie or mobile 0872750586. Cork: Tuesday nights from 20:15 in The Briar Rose, Douglas, Cork. Limerick: Tuesday nights from 20:30 in The Castletroy Park Hotel, Castletroy, Limerick. For directions please click on maps below.